Vineyards, terroir, AVA and appellations, climate…what’s the point of it all? If that’s all there was to wine, it would taste like dirt. I’ve had a few that did and I’d rather eat a 10 year old tennis shoe than revisit that. Of course, the grapevine isn’t everything either. Last I heard, eating grape vines wasn’t a great experience either although some winemakers are so heavy handed with the oak that you may as well be eating wood. No…the point of all of that is to produce a small piece of heaven, a jewel on the vine – the wine grape. The ideal grape that possesses the perfect balance of acid and sugar can be so perfect in its flavor, that when delivered into the caring hands of a gifted winemaker, produces something sublime. Everything else is just prep-work to get to the culmination of the growing process – the fruit. Consider the vineyard planning, management and decision of when to harvest as the pre-season to the regular season. The quality of the grape is the first step to determining the quality of the wine. We said it in the introduction to this series of posts but it bears repeating. A great winemaker cannot make good wine with bad grapes. First, let’s put a stake in the commonly held misconception that wine grapes are not sweet. Nothing is farther from the truth. Most wine grapes are far sweeter than normal table grapes. The also have so many woody seeds (Called pips) that only a beaver could chew them thoroughly. Wine grapes need that extra sugar to convert to alcohol while still retaining enough fruit flavor so the wine stays in balance. Try making wine with normal table grapes and the resultant liquid (I won’t even call it wine) will be sour, bitter or both and drinking it would be as appealing as downing a mixture of vinegar and pureed grass clippings. Although almost all wines are made from the grape species, Vitis Vinifera, the types of it are almost innumerable. Just list off the common ones that you know…Cabernet Sauvignon, Chardonnay, Pinot Noir, Syrah…yada…yada…yada. The varieties number in the hundreds and each variety has subtle differences that give the wine its character. Skin pigment and thickness, number and size of seeds, the amount of sugar and acid when ripe are some of the biggest contributors to the character of the grape. Other than the winemakers, hand the grape is preeminent in determining what a wine will taste like. Young, unripe wine grapes are generally low in sugar but very high in acid. 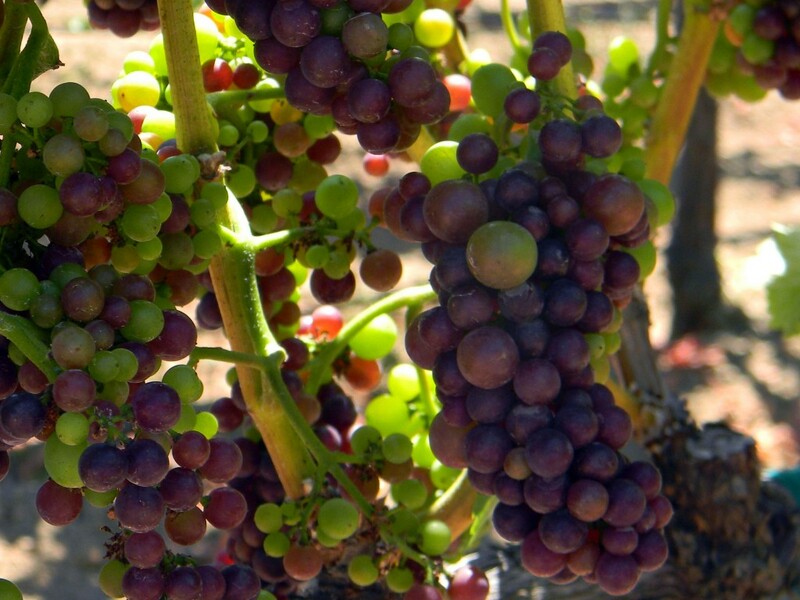 As grapes begin to mature, they go through a stage called, veraison which occurs when the grapes first begin to ripen. When they are at their peak ripening just before harvest, they can increase their sugar content dramatically in a single day so the timing of picking the grape is critical. Wait just a few days to long and the desired balance of acid and sugar is gone and the wine maker is forced to add acid artificially. Pick too soon, and the wine doesn’t have enough sugars to finish fermenting at a normal alcohol level with enough fruit flavor present to counter the stronger acid finish. Usually, the higher the sugar level of the grape, the higher the alcohol content of the wine will become unless fermentation is artificially arrested. If the sugar level gets too high, the remaining wine can become so sweet that it would trigger a seizure in a diabetic just by getting near an unopened bottle (ok, it probably wouldn’t actually trigger a seizure but the resulting wine can even make a chocolate bar taste bland). As grapes ripen, the sugar increases. Close to harvest, careful winemakers will begin to measure the sugar levels. Sugars levels in grapes are measured in brix basically a fancy term for measuring the sugar content of a wine grape. There is equipment to measure the brix of a grape but many wine makers rely more heavily on the taste of the fruit and even its feel. Grapes with higher degrees of brix will some times squeak when crushed due to the higher levels of sugar. The climate and the wine grape variety primarily determine the amount of sugar in a grape. Most wine grapes are picked when the mix of sugar and acid will produce a well balanced wine that is not overly sweet. However, in warmer climates, some grapes are intentionally left on the vine to overly ripen and develop very high sugar levels. These late harvest wines are high in alcohol but also have some sugar left over after the majority of it has been converted to alcohol. The remaining sugar, called residual sugar, gives late harvest wines their characteristic sweetness. In cooler climates, a different process also produces sweet wines. Some grapes are left on the vine through the first freeze of winter. The water of the grape freezes but sugars and acids don’t. When the grapes are crushed, the juice runs free but much of the frozen water stays behind with the skins resulting in a very concentrated and sweet juice. Both late harvest and ice wines are usually served as dessert wines. Up to this point the grape has lived a well tended and pampered life but come harvest time, things will change.